Its mid-October and the sun is getting lazy, rising reluctantly well after eight o’clock. Yet, way down south on the toenail of Spain, there is still heat in that slothful sun. Andalucia. Vejer de la Frontera. A sprawling hilltop town – un puebla blanca – with a bird’s eye view across the flood plains of the Barbate River to the Straits of Gibraltar. 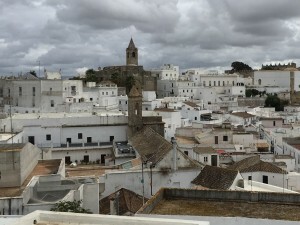 A strategically placed fortress town since Phoenician times, Vejer has also been occupied by the Carthiginians, the Romans, the Moors and the Castilians. 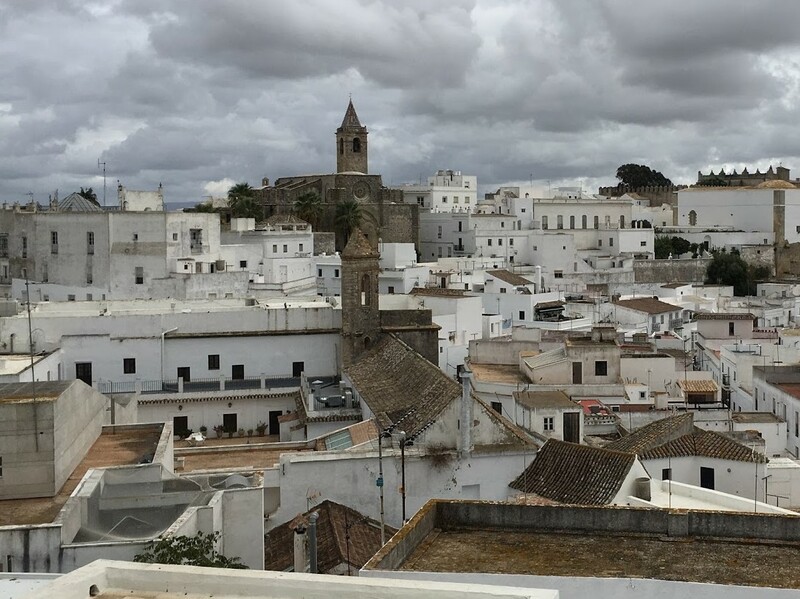 Until the 21st century, the women of Vejer wore long, black cloaks and scarves – cobijada – that veiled bodies, hair, faces like nuns’ habits, a nod to a Moorish past, depicted in paintings all over town. The town has had several name changes over the years. The Moors called it ‘Vejer de la Miel,’ thanks to its many beehives and a thriving honey industry. The Castilians rebranded it ‘Vejer de la Frontera,’ after Ferdinand de Castilla took it from the Moors, wrapping it in high, castellated walls to protect it from further Moorish invasions, and to safeguard the local fisheries from the frequent attacks of the Barbary Corsairs, rapacious pirates from North Africa. In Vejer de la Frontera – pronounced B’hair, of course – there are still many signs of half a century of Moorish rule. But it is the church bells from the neighbouring Catholic church, Iglesia del Divino Salvador, on Calle Nuestra Señora de la Oliva that wake me up before sunrise, clamouring raucously, louder than a flock of magpies, a strident alarm at the crack of dawn. At this early hour, the air is clear, calm, cool and still. If I venture out to the echo of the bells, the town seems uninhabited by anything other than pigeons and yesterday’s litter. White washed houses hedge narrow, cobbled streets that wind up and over the hills like a mad rollercoaster, along which the bulls charge wildly every Spring. Broad, thick, wooden doors are studded with fat nails, the knocker like a closed fist. Fatima’s hand, a symbol of protection. Peek through an open doorway to see a porch decorated with brightly coloured, busily patterned tiles, or glimpse a cobbled courtyard trimmed with terracotta pots. Looking north from the Calle de los Remedios, orange orchards and olive groves lie beneath a dusty haze, and flights of wind turbines scar the horizon. Closer to home, windmills of the old-fashioned variety skirt the town, stubby and shabby with conical roofs and bare spokes. A shaded café sells a full English breakfast and a cappuccino on the pavement near the Plaza de España , where date trees encircle a vividly tiled fountain. One unusually wet morning – the first rain we have seen after days of clear skies and sultry afternoons – my sister and I leave home early, on a culinary mission. Outside the Hospederia Convento, our hostess awaits, a diminutive Scot with a huge smile and a determined attitude. Annie Manson has lived in Vejer for over a decade, immersing herself in local tastes and traditions. She talks with enthusiastic detail of the local cuisine, and local customs. 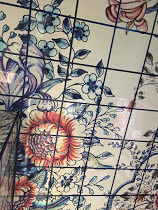 Then, two Aussie sisters, in the motley company of a Scotswoman, an Irishman, his Basque wife and a Dutch couple from Maastricht, trip down a nearby alley to a tiny market, its walls and ceilings decorated with large, hand-painted tiles depicting flowers, fish and birds in orange and blue. 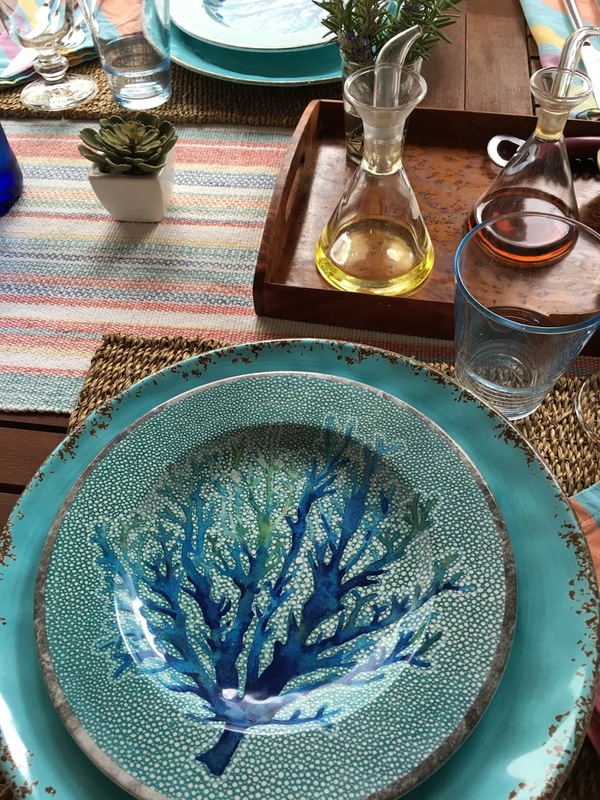 We examine an array of local fish, silver and blue, while Annie gathers supplies for our cooking class. Across the street, a corner grocer’s shop provides a variety of top notch tinned tuna, paprika, peach jam. Around the corner, in a narrow little carniceria, the butcher leans over the counter with samples of thinly sliced jamon wrapped around a baton-shaped biscuit. We nibble eagerly, squeezing into the tiny space to keep out of the rain. Superb, costly, jamon iberico de bellota or pata negra comes from the small, brown, free-range iberico pig, raised on acorns or olives. My sister and I have been introduced to this amazing appetiser already. Jabugo, a small puebla bianca to the north, is ringed by huge white, windowless jamon factories, its residents experts in this ancient industry. Along the Carretera San Juan del Puerto, numerous shop windows are strung with the dark, dangling limbs of cured, air-dried ham. Now, back to Vejer and our cooking class. As the rain sets in, we huddle under wind battered umbrellas, and scuttle up the lane to a thick wooden door in the wall sporting a head-sized hatch, like an olde worlde security camera. The house within, Casa Alegre, is a series of rooms stepping up the hillside, the bright kitchen packed to the gunnels with cooking utensils and polychromatic pottery. And the grande finale? A mouth-watering, surprisingly light Citrus Drizzle Cake, made with almond meal and drenched in an oranges-and-lemon syrup that has been imbued with cardamom, cinnamon sticks and star anise. It smells like a lush and sumptuous Christmas pudding. It tastes like heaven. Before we leave, we climb to the roof top terrace (azotea) of Casa Alegre to appreciate the magnificent view over this glorious, white-washed town and the stark, sun-bleached countryside beyond. We have talked too much, eaten too much, drunk too much and laughed hysterically with this diverse, prodigious collection of new friends. A thoroughly Andalusian culinary adventure. This entry was posted in Cooking, Spain, Travel and tagged Andalusia, Annie B. 's Spanish Kitchen, pata negra, pulpo, Spain, Vejer de la Frontera. Bookmark the permalink.